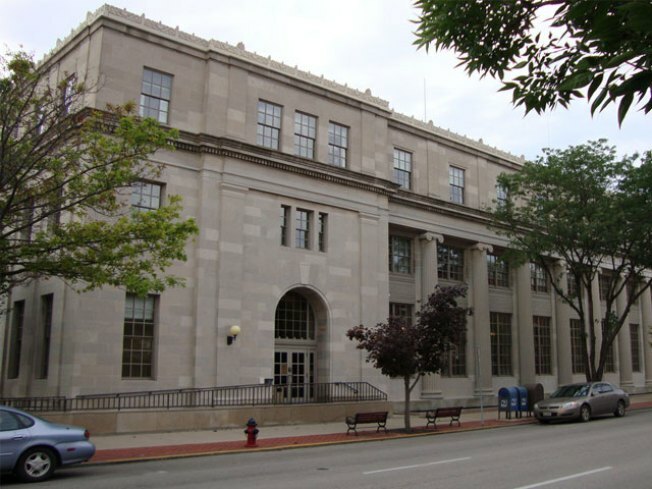 Paul Findley Federal Building and Courthouse in Springfield, Ill.
CHICAGO - Authorities arrested today a 29-year-old man who they say tried to blow up the Springfield courthouse with an explosives-filled van. Authorities say Michael Finton, also known as "Talib Islam," drove a van containing what he thought was explosive material, parked it directly in front of the Paul Findley Federal Building and Courthouse, then tried to detonate it with his cell phone. The attempt was apparently part of a federal sting. Finton got out of the van, locked the door and got into another vehicle driven by an undercover FBI agent and drove away, authorities said. Within blocks, Finton used a cell phone to remotely detonate what he thought was a bomb, agents said, according to the State Journal-Register. The case has nothing to do with the major terrorism investigation under way in New York and Colorado, federal officials say. Finton appeared before U.S. Magistrate Judge Byron G. Cudmore in Springfield and said he was a part-time cook in a Decatur fish and chicken restaurant. "The criminal complaint alleges that Michael Finton … attempted to bomb a federal courthouse, but fortunately a coordinated undercover law enforcement effort was able to thwart his efforts and ensure no one was harmed," said David Kris, assistant attorney general for national security, in a statement. He waived a hearing on the charges and was ordered held pending action by the grand jury.